March 12, 2012 March 16, 2012 Pilar B.
I was in Italy finishing my Elementary training when I found out I was pregnant, so my wonderful husband decided to surprise me by totally re-doing our spare bedroom and turning it into a Montessori room. When I came back, we worked together to add the finishing touches (mattress, nursing chair, artwork, etc.). The floor is wood and it has slight grooves and indentations that provide lovely texture, perfect for stimulating the sense of touch in a crawling baby. The closet is completely adjustable, so that we can change the configuration as Zach grows. Right now it is set up for my convenience, with lots of baskets for his clothes, blankets, linens, and diaper covers. The low rod will stay where it is, and when Zach is old enough to demonstrate interest in dressing himself, I will hang a few clothes on child-sized hangers for him to choose every day. The deep baskets will eventually be replaced with shallower ones so he can access things like socks, underwear and t-shirts, and the deep baskets will go up high for storage. The shelving unit is from IKEA, and what’s great about it is that when Zach is older we can stand it up and he can use it as a bookshelf. Right now we have a changing pad on top (which I had to make at home because all the commercial changing pads were wider than the unit). My husband is going to make a barrier across the front of the unit to prevent Zach from rolling over. In the meantime, I am very careful about keeping a hand on Zach at all times when he’s on the changing pad and placing my body directly in front of him. It was annoying at first but now I’ve gotten used to it. 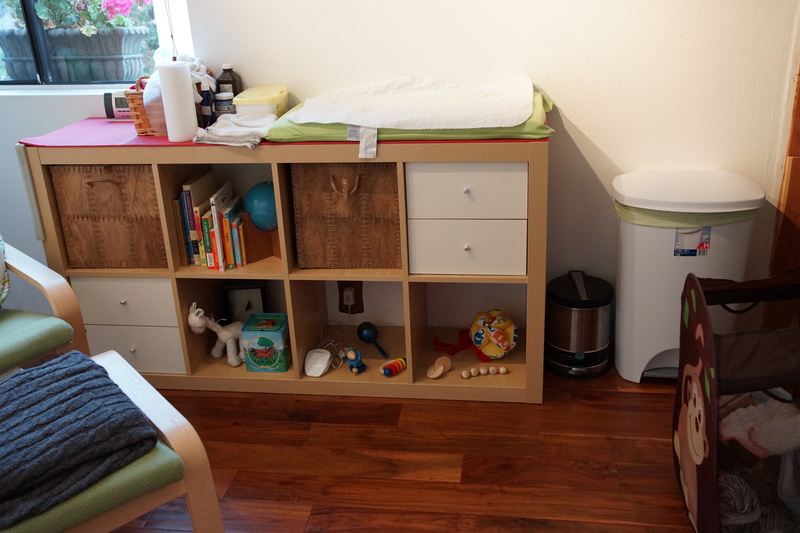 The cloth diapers are kept in a box just below the changing area, and the rest of the diapering supplies are next to the changing pad, at arm’s reach. This took a bit of readjusting to get just right, but now it’s super comfortable and makes the changing process quick and efficient. 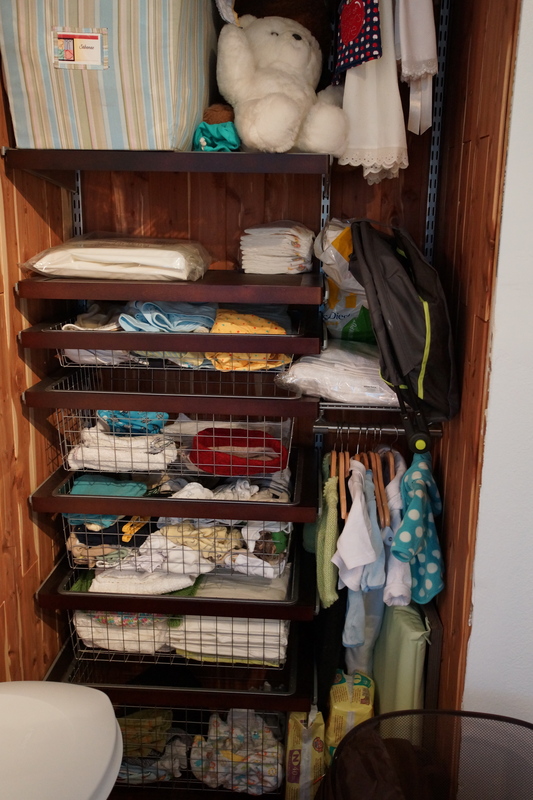 The rest of the shelving unit consists of two sets of drawers: the top right-hand one has socks and undershirts, while the bottom left-hand set holds toys and mobiles that Zach is not yet developmentally ready for. We also have a box in the unit where I’ve stored larger toys that Zach has received as gifts. As he grows I will introduce them one by one and gauge his interest. So, what’s visually available to Zach right now? On the top row I have several books in Spanish and English. We’ve started reading to him (he’s seven weeks old) and the books are easily accessible to me from the nursing chair. Once he’s old enough to choose what book he wants read to him, I will limit the number of books available to 3-4 (and rotate them in and out) so he doesn’t become overwhelmed. It keeps the room organized and uncluttered, so that this becomes his model of what a living place should look like. It allows him to see what toys he has, so he can make his own choices without becoming overwhelmed by too many options. It helps him to remember where everything goes, so that he can put things back in their place by himself (with a little help from me at first, of course). To the left of the shelving unit is the nursing chair, set up in a lovely corner with two windows. I chose this reclining chair from IKEA because it is not a rocking chair or a glider. Since the room is designed for Zach to be able to move around at will, I didn’t want to have a chair that could pose a pinching hazard for his fingers. This chair not only is less expensive than most rockers and gliders, but it’s super comfortable, attractive, unobtrusive, and safe for little hands to explore. It has a slight rocking movement that Zach and I really enjoy. On the window sills I placed two pots with geraniums, which are colorful and hardy and brighten my day. Zach loves looking at the window when he nurses; he’s attracted by the dark/light pattern of the wooden blinds and the bursts of color from the flowers. The floor bed is actually a crib mattress from IKEA. We are transitioning Zach from his bassinet to the floor bed, so right now we have an extra pad on the bed (the green pad pictured here, which used to be in his bassinet). In a few more days I’ll remove the pad and my big boy will sleep on his floor bed! (I’ll soon post about how we transitioned him to his own room.) The floor bed is arguably the most important part of the Montessori room, because it allows the child to be independent in his environment. Once Zach starts crawling he can get in and out of bed by himself (which will be interesting during nap time, but we’ll cross that bridge when we get there). Unlike a crib, the floor bed prevents the meltdowns associated with putting the child in what he feels is a cage-like environment. 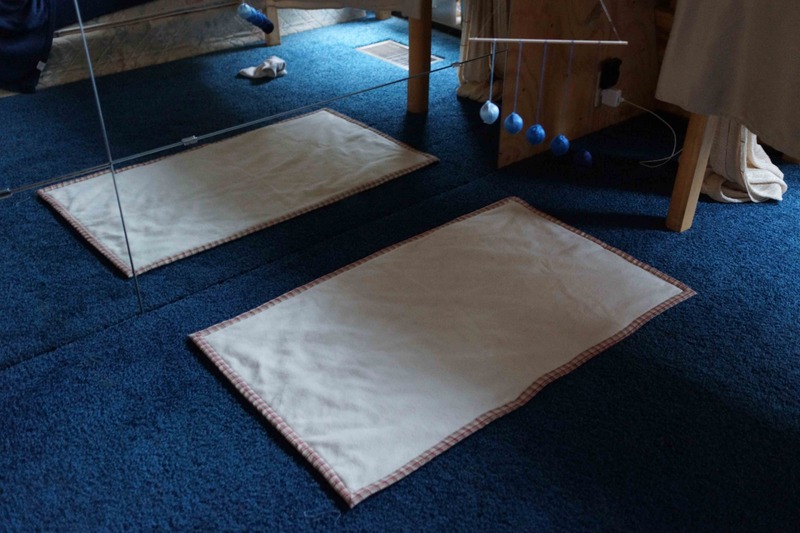 But even before a child is mobile, the floor bed provides a developmental advantage because it helps him develop awareness of where a surface ends. A small baby on a floor bed can move across it and feel where the bed ends. If he keeps moving, he’ll roll off the bed and onto the floor, but the fall will only be a few inches. Very quickly he’ll realize that in order to stay on the bed he needs to stop where he feels the surface ending. This in turn will prepare him to make better choices near stairs and on taller beds. Of course, it’s important to always supervise crawling babies near stairs and never leave them unattended on a normal-sized bed, but I have heard from many Montessori parents who say that their child showed a healthy respect for stairs from the moment they approached a step for the first time. 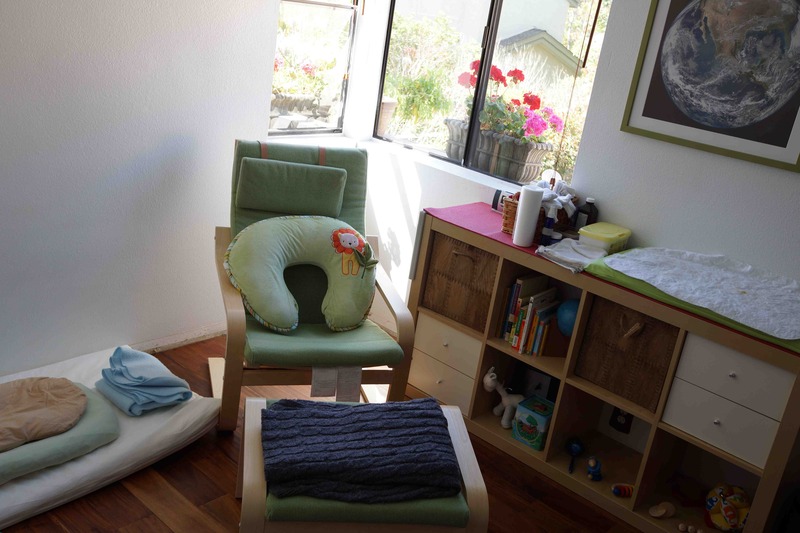 The last area of the Montessori room, the activity area, is not actually in Zach’s room because of lack of space. (Note: some people choose to set up the mirror and activity area in the same space as the bed, with the mirror running alongside the bed. I feel that this sends a conflicting message regarding the use of the bed. Is it for sleeping or playing?) We chose to set up the mirror and activity pad in our room (which will eventually become the living room/rec room once our bedroom is constructed). My husband placed mirrors on the wall and hung a fishing line from the ceiling. From here I can hang mobiles, and when he’s ready I’ll be able to hang grasping and kicking toys that will help Zach develop important motor skills. Currently he loves looking at himself in the mirror and seems to get a kick out of seeing me reflected when I approach him. He also spends time checking out his mobiles and even does some tummy time with encouragement from mom and dad. I made an activity mat for him with two different fabric textures to stimulate his senses (and to keep him off the carpet). Once Zach is sitting up on his own, we’ll install a low bar across the mirror so that he can practice pulling up and then walking. The mirror helps him to gain a clear understanding of his body and his surroundings. We have more shelving units in this room, and the two lowest cubbies will belong to Zach. Here he will keep the toys that he’ll use in the activity area (such as the Takane ball). 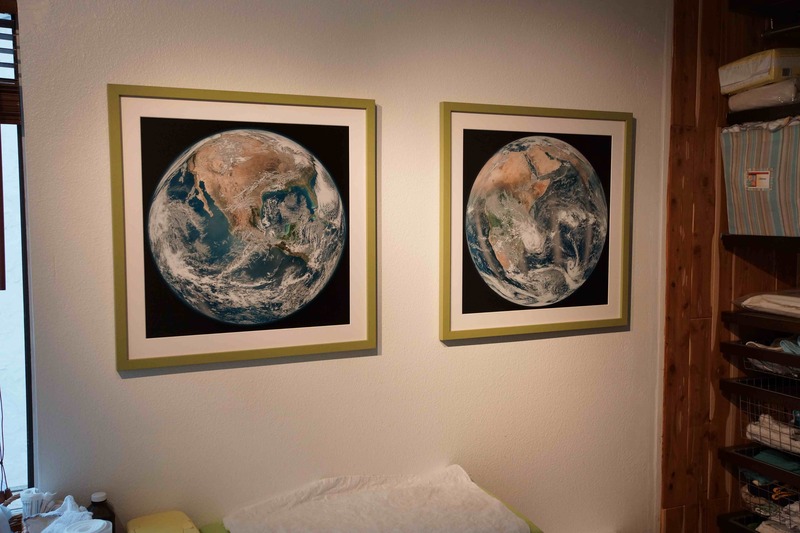 The artwork pieces that we chose for his room are intended to inspire admiration and inquisitiveness. The tiles with the sailboat are from the Amalfi coast, one of our favorite places on the planet and somewhere we hope to take Zach one day. The two photographs of the Earth show the two hemispheres and will hopefully inspire Zach to want to know more about our planet. 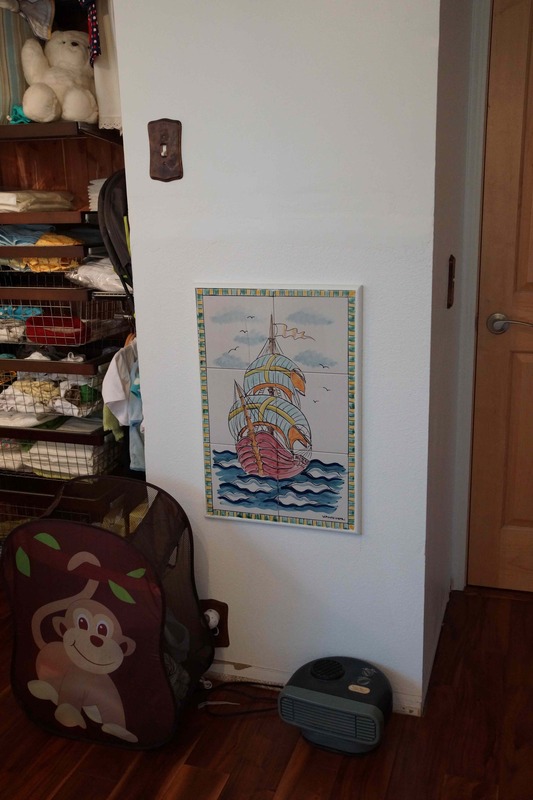 We also placed a low frame near his bed (not shown here), featuring artwork that will be rotated every couple of weeks (note: A great way to find artwork is to buy cheap outdated calendars of different painters and photographers). None of these pieces are meant to be preached about to Zach, but are instead provided to let him inquire, investigate, and discover on his own. I hope you’ve enjoyed this tour of Zach’s Montessori bedroom. Setting it up took a lot of thought and effort. I wasn’t alone; my dear friend Jenny Paynel, owner of Voila Montessori home consulting, was enormously influential in our decisions. Jenny holds both the Assistants to Infancy and Primary trainings, was my mentor during my own Primary training, and is also an amazing mom! If you would like to know more about how to set up or modify your child’s bedroom to best support his development, Jenny can help. This Montessori room has worked beautifully so far and we look forward to continuing to modify Zach’s environment to meet his ever-changing needs. 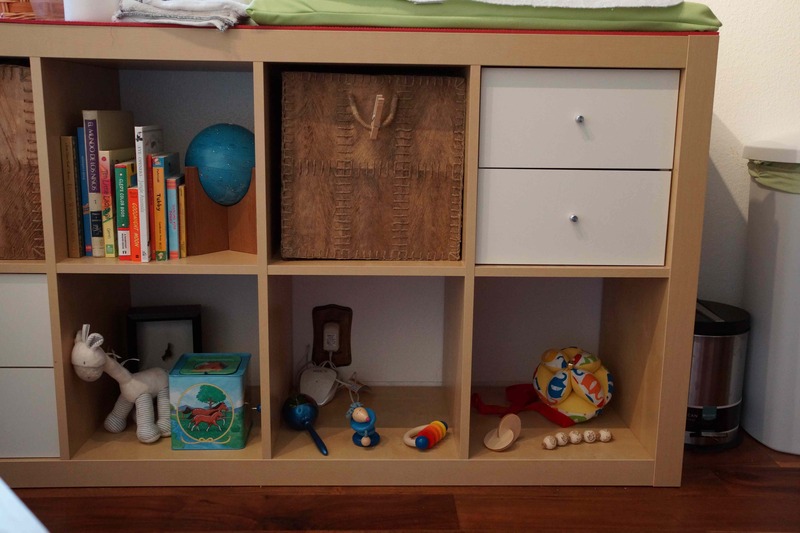 I am re-thinking the baby’s nursery into a Montessori one and I find your post very useful ! Thank you ! Is she offering free consultation or is it a payable one? I am Jeanne-Marie Paynel the consultant that was mentioned in this blog. I would be more then happy to assist you in modifying your environment. Please do not hesitate to contact me through my website http://www.voilamontessori.com. Re: the floor bed and naptimes, my (1st) daughter never crawled/toddled out of bed at nap- nor bed-times. And to this day (3.5 years old) she still doesn’t get out of bed once placed there. I don’t know if it’s just her own personality or whether, because she never had an initial “cage from which to escape” she had no reason to develop the “I’m going to get out of bed now that I [finally] can” desire. Great post and nice blog! I was wondering, how thick You sew activity mat? I can’t find any info about thickness of mat for an infant activities..
Hi Linda! My son’s first activity mat was about 1 inch thick. Now he has a rug that’s about 1/2 inch thick on top of carpet. Some people use a thin mattress at first (about 1.5-2 inches thick) but when babies start standing up it might be better to have something less cushiony (that’s why a rug works well). Hope that answers your question! Yes, a thin mattress would be best on a wooden floor! Good luck with your project, I think your baby is very lucky!! Send me a picture of your finished project if you can. Take care! Hi! This was an awesome read, I really appreciate you posting and the thought that went into Zach’s nursery! 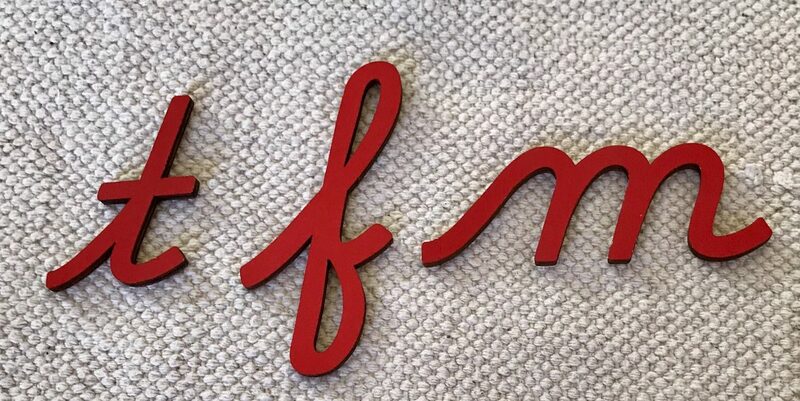 I’m very new to montessori but a friend recommend I check it out as it seems to “fit with us” as she put it. My little guy is 7.5 mo right now and I’m so curious where I can learn more about what would be developmentally appropriate for him now and time leading up. Do you have any good resources or such you could pass along? Thank you for such a thorough tour again… sometimes I’m worried we don’t have “enough” compared to what you typically see in a nursery but this reassured me! Can you tell me how to “defend” the floor bed when parents argue that it doesn’t keep children safe from siblings, pets, or wandering into dangerous situations? Basically, the entire room has to be baby-friendly (no outlets, nothing a toddler can climb, nothing that he can swallow/break, etc.) I close the door when he sleeps so he can’t accidentally crawl or walk out of the room. Our dogs are trained not to go into his room. With siblings things get a little more tricky but I know several people who do have two children on floor beds in the same room and with some ground rules and good supervision it works. Thank you for this post. How old was your son when he started sleeping on the floor bed? 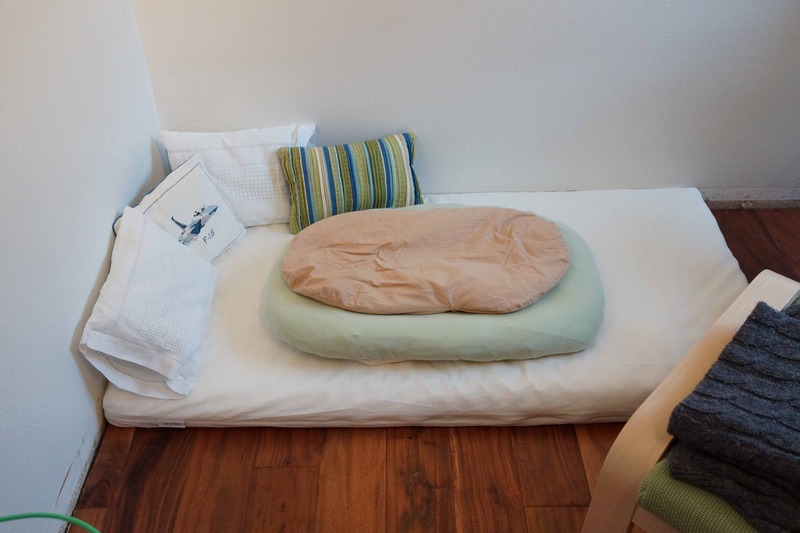 Did you have concerns about having pillows nearby? Hi, Zach was about 2 months old when he fully transitioned. I was not concerned at all about the pillows. He’s always been very strong and was able to roll and move away from anything obstructing him. 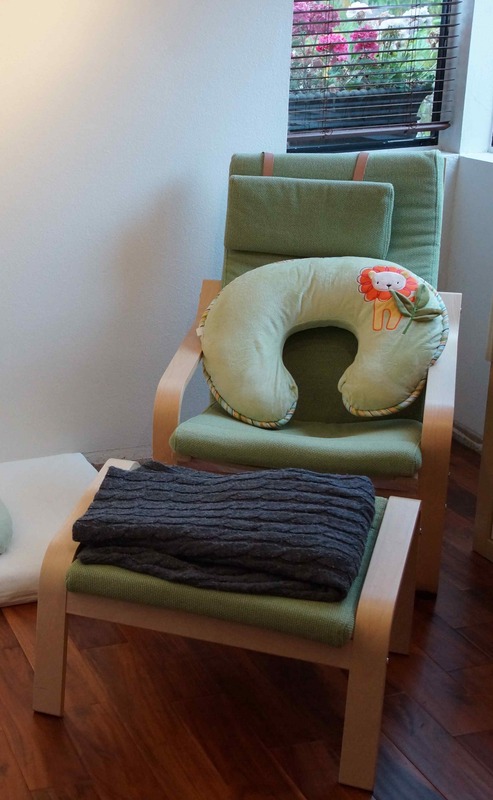 Also, they were very light and hard pillows, not anything soft and heavy that would smother a baby.